Not only is it a privilige to enjoy a tasting in the minimalistic living room of Agathe Bursin, to try a barrel sample of her extraordinary Pinot Noir is heaven. It is logical that the last couple of years, La Revue du Vin de France has selected her reds as being among the best of Alsace. 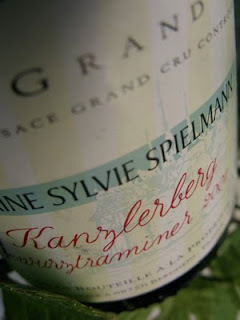 It grows on Strangenberg, the hill which connects Grand Cru Vorbourg with Grand Cru Zinnkoepfle, where a calcareous bedrock and a protected exposure provide perfect conditions for Pinot Noir. 2009 Pinot Noir Strangenberg from Agathe Bursin in Westhalten bursts of varietal aromas: black cherries, burned rubber, blackberries, vegetables and Seville oranges. The taste has great volume and is saturated with fresh and vibrant fruit. A simply stunning barrel sample that will be released in June 2011 after 18 months on oak. Price: € 14.00. Sadly enough, the vineyards between St Hippolyte in the south and Mittelbergheim in the north do not catch the attention that they deserve. Maybe it is because ikonic wineproducers are missing. 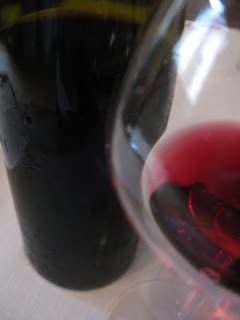 Nevertheless, many very good wines are produced here on granitic foothills that give relatively lightweight but well structured wines with a lot of finess, purity and character. 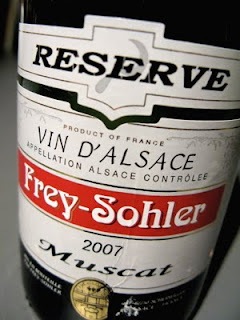 2007 Muscat Reserve from Frey-Sohler in Scherwiller is a 50/50 blend of Muscat Otonell and Muscat d'Alsace. The aroma is developed with pears, fresh grapes, white peppar and peaches. 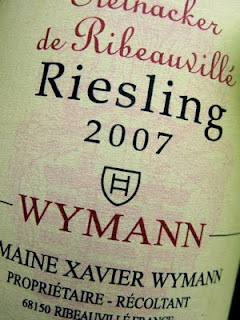 The taste is medium weight (to be a Muscat, that is) but sec, and well balanced with a nice backbone of tartric acid. A solid effort. Price: € 7.00. Located in the geological fracture zone, Ribeauvillé has a great variety of subsoil geologies. These range from the granite of St Ulrich, over sandstone, limestone and marl to the alluvial soils deposited a mere 15 000 years ago. This is were we find Steinacker, a stoney (quite logically), warm vineyard which yields ripe, open and early maturing Rieslings.